This position is open to any person willing to move furniture that currently has a valid Class A or Class B CDL license. No furniture moving experience is necessary. We provide all training needed to enter the moving and storage business. Overnight travel is required with motels and meals paid for by Bean’s. A clean driving record is a must. Excellent starting wage and benefit package including bonuses, health care, and a 401-K plan. Open to any person willing to move furniture but does not want to drive a truck. Excellent starting wage and benefits including bonuses, meals, and a 401-k plan. This position is open to any person willing to move furniture that has a valid driver’s license wanting to obtain a Class A or Class B CDL. No experience is necessary. 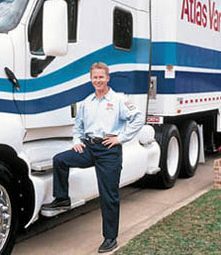 We provide all training needed to enter the furniture moving business as well as free training to obtain a CDL license. Overnight travel is required with motels and meals paid for by Bean’s. A clean driving record is a must. Bean Moving & Storage offers summer employment, which is an excellent opportunity for college students to take advantage of our college scholarship program. The average student employee earns $4,000 – $6,000 a summer. Fill out the form below and we’ll give you info on what you need to know to become one of our many satisfied clients. Bean Moving and Storage, Inc.